Alex Petcu presents the first concert of the series, with “An Exploration of Resonance”. A fusion between a musical composition and a Sound Bath, “An Exploration of Resonance” builds on Alex’s performance from this year’s Quarter Block Party festival. The music will feature bell plates, gongs of various types, temple bowls, chimes and many unique instruments that Alex has constructed himself. An Irish musician of Romanian origin, Alex is quickly establishing himself both nationally and internationally as a percussionist of the finest calibre. His recent appearances as a soloist with both RTÉ orchestras and the Irish Chamber Orchestra are some of his main highlights so far. 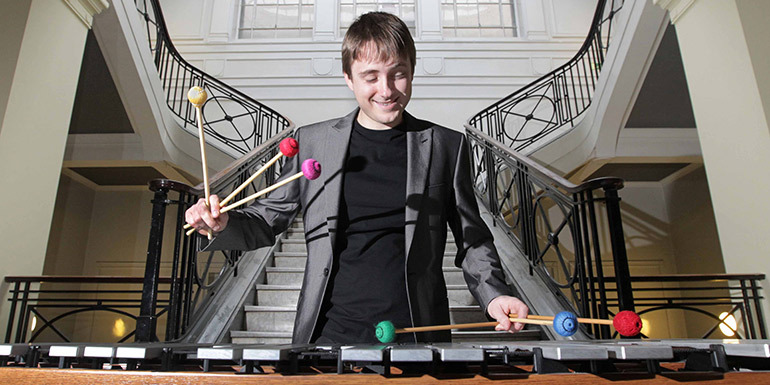 An active freelance musician, Alex performs with a wide variety of ensembles and in a range of settings including with the Crash and Hard Rain Ensembles, Bangers and Crash Percussion, the professional orchestras in Ireland, as a soloist at various festivals, as a theatre musician and much more. His début album, Alex Petcu: In Time, has recently been released on the RTÉ Lyric FM label. Following on from the success of last summer’s inaugural 6 Summertime Concerts, the Triskel Arts Centre has programmed another exciting lunchtime concert series at Triskel Christchurch. The series showcases predominantly Irish artists, featuring repertoire ranging from Baroque and Classical to contemporary “Sound Bath” style works.